What’s Cooking in New York? This amazing city is my home now. I never thought a year could pass in a blink of an eye, but that’s what it feels like. We’ve been living in New York for over a year now. And what a year it has been! A lot of hard work of course, but also a lot of exploring what New York has to offer. This city is heaven on earth for a foodie like me. But it’s simply impossible to keep up. There are new hot spots opening up every week. My “to do” list is endless. But we are trying our very best. We’ve tried 225 restaurants so far, and working on checking off as many as possible on our endless list. A lot of revisits to our favorites of course, but it is all about the search for new inspiration and unforgettable food experiences. These Are 10 of My Favorite Restaurants in New York City Right now. A legendary Village institution with a 100-year-old history has reopened with a fresh modern look and great ambience. A great selection of crudo, cheese, flatbreads and smaller plates. The beef tartare with watercress, pickled mustard seeds and crispy quinoa is a favorite. And the cocktails are excellent! The sleek cocktail bar has very high ambitions and tons of experience behind it. Cute place in the East Village. 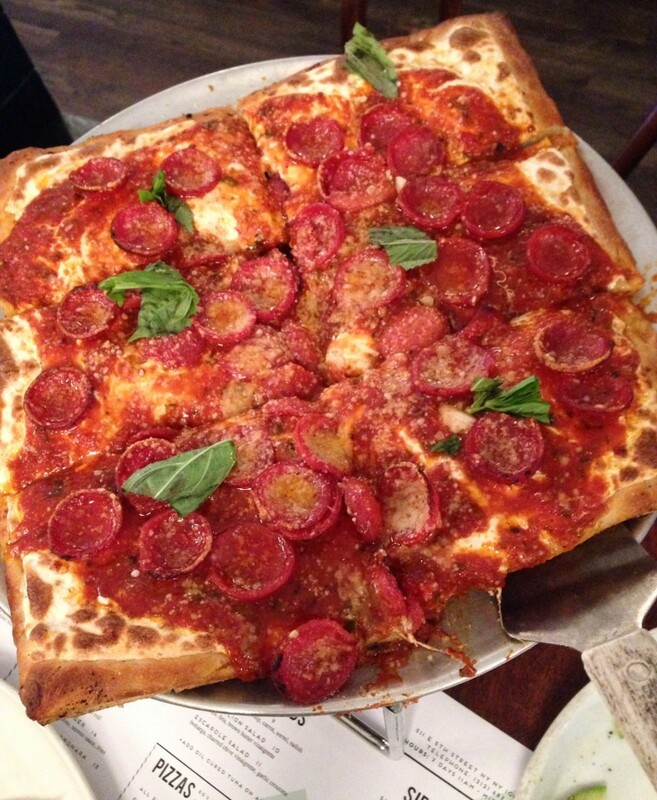 Try the Grandma Pie with peperoni. It is amazing! I find myself dreaming of this pie from time to time. Will be going back very soon. Newly opened on West Broadway. A part of the giant The Major Food Group. (Carbone, Parm, Santina, Dirty French) It is a beautiful Jewish bakery, deli and bistro. I am not a bagel person, but after trying the “everything” bagel with the amazing salmon salad I’m now a fan. 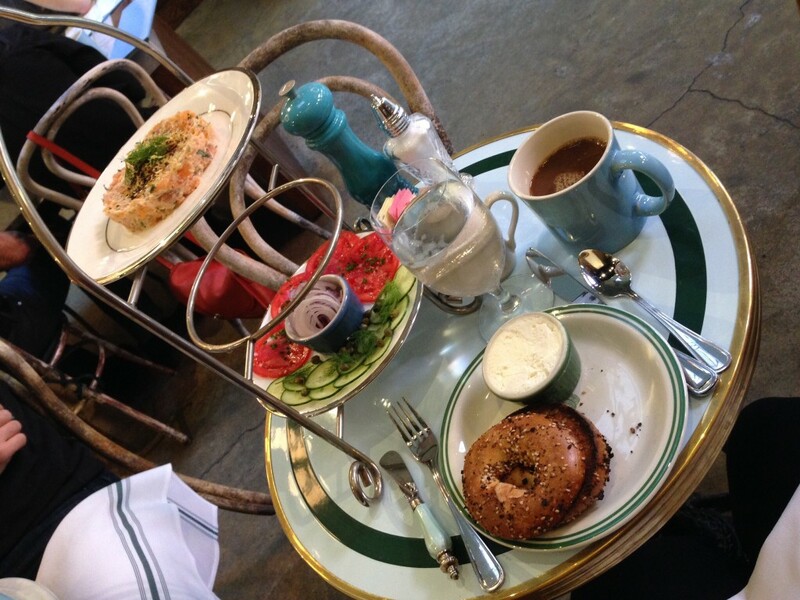 A great place to enjoy great food and ambience, spot celebrities and fall in love with bagels. Bagel at Sadelle´s in NYC. Opened this summer two doors down from its hyped big brother Contra on Orchard Street. This is a cute wine bar with a smaller plate format. Everything we tried was very fresh and packed with flavor. The spicy tuna with scallions and tomatoes on toast was delicious. In the mood for some Cajun seafood? Go for one of the combos. I had the crawfish and shrimp combo with The Boil special sauce. You’ll get an apron and surgeon gloves. Your seafood feast will be served in a plastic bag. You will get messy and thirsty for too many margaritas, and your breath will reek of garlic. In a party mood? Come here for great cocktails, loud music and a stellar burger. And one of the pros is that the kitchen is open until 2am. So you can choose if you want to come here before or after you get buzzed by your Friday cocktails. Just received their first Michelin star. Amazing affordable spicy Thai food. Try their Spicy Thai Ale, especially brewed for them by Barrier Brewing. Your dinner should include the green curry snails with a side of roti, spicy rotisserie chicken and banana blossom salad and some grilled seafood with dipping sauces. A Japanese Izikaya on the Lower East Side. A very good selection of sake and innovative cocktails. We always like to order a bunch of their smaller plates to share. But make sure you order your own “Egg on egg on egg”. 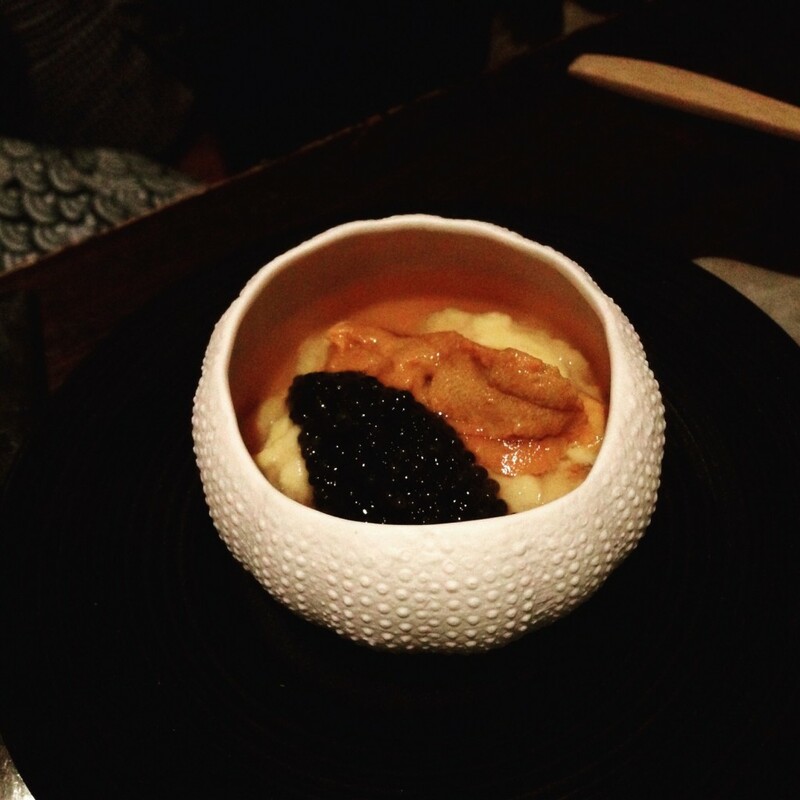 Uni, caviar and scrambled eggs. Amazing! Egg on egg at Sakamai´s in NYC. Modern Italian with a relaxed atmosphere. Located on Grove Street, close to their sister restaurant and old favorite Buvette. Ask for the daily special pasta. Whatever it is, it will be amazing. Don’t miss the Svizzerina and the Funghi. Cozy neighborhood gem next to their amazing cheese shop. Indulge in a great selection of cheeses and charcuteries and a variety of smaller plates like fried artichokes, chicken liver mousse and sliders. All with some kind of cheese of course. Try the Buffalo cheese curds. They are truly life changing. What is Trending in NYC Right Now? Well, there are a lot of new vegetarian or vegan new hot spots. I have always been a bit prejudice about vegan and vegetarian food, probably because I didn’t know any better and because I am such a meat lover. But I have really become converted. 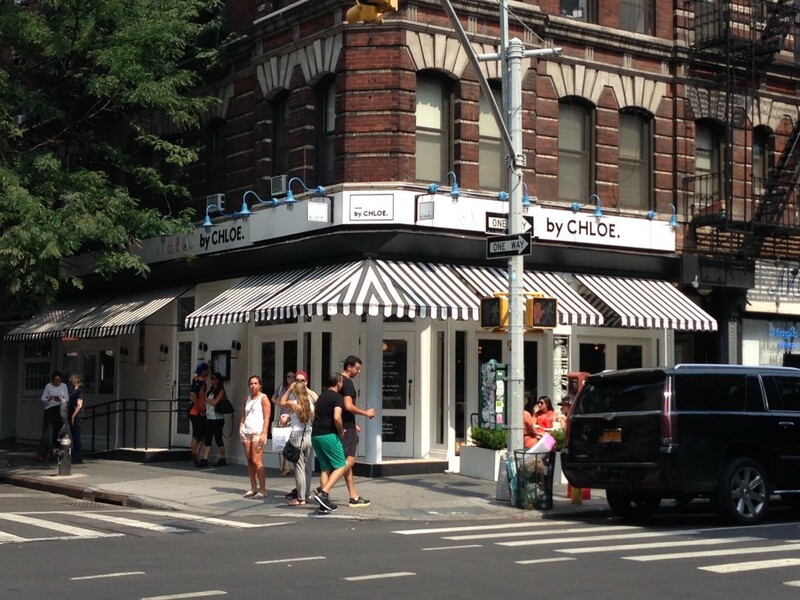 The Facade of By Chloe in New York City. But everything is truly delicious and healthy. I’ve tried the burgers, Mac n’ cheese, salads and their air “fried” sweet potato fries. Yum! Other vegetarian/vegan hot spots are the Butchers Daughter, Ellary’s greens, Superiority Burger and Avant Garden. I have a couple of restaurants that I really want to visit in NYC right now. am really excited about High Street on Hudson. High Street on Market in Philadelphia was one of this year’s best dinner experiences, and in a couple of weeks they are opening on 637 Hudson Street. So it is basically a 10-minute walk from our apartment. Yay! I am also looking forward to upcoming dinners at Korean Oiji in East Village, Gabriel Kreuther, Ducks Eatery, Babu Ji and Yunnan BBQ. Until next time.. Eat and drink well my friends. Which one is your favorite restaurant in New York City? Please fil in via email, in the comments below, on Twitter, Facebook or Google+. If you want to read Lisa´s findings from earlier this year, please check out “A Foodie´s Favourite Restaurants in NYC“.